You shall love the Lord your God with all your heart, and with all your soul, and with all your mind, and with all your strength’ (Mark 12:30). 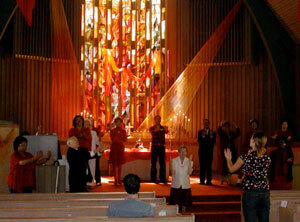 Worship begins at 11:00 with gathering music and a call to worship and is a blend of traditional and contemporary. We believe the goal of worship is to experience and respond to God with all that we are—heart, soul, mind and body—so we seek to make our gatherings participatory with a mix of silence and sound, stillness and movement, images and word. We borrow from a variety of Christian traditions, styles and practices and blend them together with lots of room for the Spirit. Worship may vary from week to week but will always include prayer, silence, singing and listening to scripture. And each service concludes around the Lord’s Table with Communion, a simple meal of bread that is broken and a cup that is shared. This meal forms the center of our life together. Come Share the Feast at the Table.